of locating the particular property you are searching for in Oklahoma. 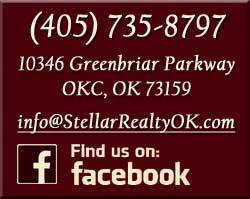 The Stellar Team is available to schedule showings of your top selections by calling our office at (405) 735-8797. Ready to lease a town home? If you are interested in leasing one of our town homes, please complete our online questionnaire HERE. Our staff will review your submission and contact you soon to schedule a showing with Kim. "The greatest experience in sale of home. Greatest Staff Ever!!"